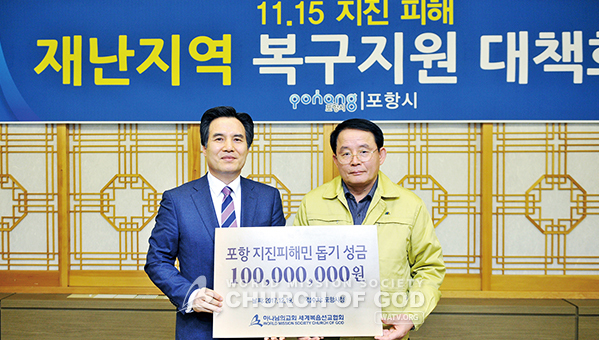 On December 19, General Pastor Kim Joo-cheol delivered a relief fund for earthquake victims to Choi Wung, the deputy mayor of Pohang. Around 2:30 p.m., on November 15, Korea shook for a moment. A 5.4-magnitude earthquake occurred in Heunghae-eup, Pohang, and tremors were sensed in all parts of the nation including the cities of Daegu, Busan, Incheon, and Seoul. This is the second largest earthquake in Korea after observations began, but the damage is the largest ever; more than 90 persons were injured and 27,000 civilian facilities and houses were damaged or collapsed, exceeding KRW 50 billion [USD 50 million] of damage. The victims were greatly shocked and distressed, losing their nests in a moment. Most of them hurriedly came out of their homes at the risk of collapse and stayed in temporary shelters like an indoor gymnasium, without any promise of return. The Korean government has declared Pohang City as a special disaster area and took measures to recover the damage. Meanwhile, relief funds and goods from all walks of life were rapidly delivered to the victims. The Church of God members in Pohang too stayed with them and gave their helping hands to their neighbors in crisis. They set up a free meal service camp at the Heunghae Indoor Gymnasium, where more than 400 quake sufferers were staying, and provided meals from November 21 for the victims who had difficulty in having meals though their accommodation problem was solved. The volunteers from the church cooked rice and soup, considering its taste, nutrition, and hygiene. Every morning and evening they also cleaned the indoor gymnasium that has poor ventilation, worrying about the victims’ health. The free meal camp opened for six days a week except the Sabbath day, and the average number of visitors was from 200 to 400 a day. Most of the refugees were in their 70s and 80s, but there were also adults in their 30s and 40s who went to work in the morning and returned to the gym in the evening, including housewives who picked up their children after school and visited the camp. The volunteers took care of each and every sufferer, helping the elderly come to the camp or visiting them to hand a packed meal. “Their sincerity is seen from each and every dish they serve. They are so kind just like my son or daughter. I can endure this suffering out of my house thanks to them,” said Kim Hu-bul, a senior citizen living in Heunghae-eup. “I lost the foundation of my life and hope. But many came to comfort me. I thank them so much. I will take heart and live hard to repay the volunteers who help me day and night as if we are family,” said Lee Gwang-yeol, another senior citizen in Heunghae-eup, who couldn’t sleep due to worries after the earthquake. The camp provided meals also to government officials and volunteers who were making efforts for countermeasures and to help the victims. Between mealtimes, the camp was kept open and used as a shelter where the victims shared a cup of tea and forgot pains for a minute, and as a guest room where the persons concerned could share useful information. The next place where Mother and the party headed was the Church of God free meal service camp at the Heunghae Indoor Gymnasium where the church volunteers were working. Mother encouraged the volunteers who were serving the victims with Mother’s heart even in the cold winter, shaking hands with each and every one of them. Mother looked at the cooked rice, soup, and side dishes, and praised them, “The victims cannot help but gain strength as you cook this wholeheartedly. These are very delicious.” She also blessed them, “You’re doing good deeds, so you will receive much blessing.” There was a 70-year-old lady who was having lunch late at the camp. Mother soothed her and encouraged her to take heart as her neighbors were with her. The elderly woman thanked for Her warm care. “The food melts in my mouth. I wanted to die at first but now I want to live thanks to these beautiful people. I see hope. Thank you very much. Later I too would like to help others and share even a little bit with them,” said the lady. That evening, Mother visited the Jungang Church of God in Pohang, where the Third-day service was held with the members from Pohang and Gyeongju. Mother called not only the members in Pohang but also those in Gyeongju, who had suffered an earthquake last year, to the service and said, “I’ve worried a lot, but I heard that our members had almost no damage by the grace of God. But let’s regard our neighbors as our members.” She expressed Her gratitude to the church members who were helping the victims with one mind. Wishing that all the neighbors too will be able to escape disasters and get salvation, She asked the members to make more efforts for neighborly love both physically and spiritually. General Pastor Kim Joo-cheol awoke the pride of the members who were working together with God the Greatest in preaching the gospel and practicing love, through the sermon under the subject, The Greatest Work.